Canada: British Columbia (Kamloops / Kelowna / Vernon / Vancouver / Lower Mainland / Victoria); New Brunswick (Fredericton / Moncton / Saint John); Nova Scotia; Ontario (North-Central / South-Western / Toronto / South-Central Ontario); Prince Edward Island; and Saskatchewan (Central SK / Prince Albert / Regina). Free Delivery within 50 miles / 80km of our locations with further deliveries available. Click on the location closest to you for more information! Looking to become a Rent The Chicken Affiliate to offer our service from your farm or homestead? Click here for more information! Thought of Raising Backyard Chickens? Every Spring, thousands of chickens are sold at local farm supply stores. Often these chickens die before they are ready to start laying eggs (16-30 weeks). Children quickly realize that chicks are not as fun as the Xbox and parents find out that chickens can not be house broken! The costs quickly start becoming more and more, then chickens are "sent to the farm". Other people think about chickens but think they don't have the space, worry about regulations, or just don't know what they need. Do you build or buy a coop? Do you buy peeps? How do you raise an egg laying hen if you buy a peep? Did someone tell you about a heat lamp? It can all be overwhelming and we take the guess work out of all of the questions by offering a portable coop, the food & supplies, and the egg laying hens! Why "Rent The Chicken"? 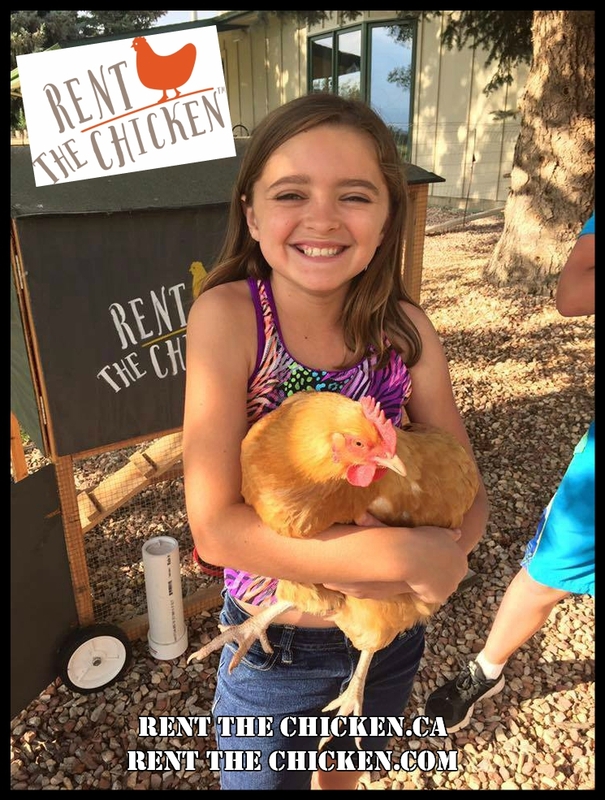 We provide all of the supplies you need with the rental: portable chicken coop, two or four egg laying hens, 100-200 pounds of feed (optional non-GMO or Organic feed available), food & water dishes as well as instructions on how to keep your chickens happy! Within two days of the arrival, your chickens will lay eggs ready to use! These eggs have 1/3 less cholesterol, 1/4 less saturated fats, and 2 times more omega 3 fatty acids than store bought eggs. Your Rent The Chickens should lay 8-14 or 16-28 eggs per week depending on your Rental Package. You will know exactly what your chickens eat! How does it work? We schedule a date to bring to your home a portable coop, two or four chickens that are already laying eggs, and the supplies needed for your rental period. Chickens produce the most eggs when daylight is at peak. 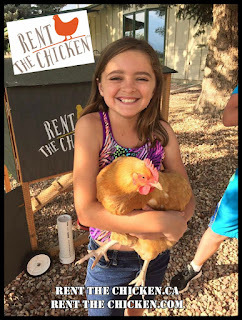 Towards the end of the Rental Period, if you realize that you were born to raise backyard chickens, adopting the chickens and all of their supplies is an option! Otherwise, we will schedule a date towards the end of your Rental to stop by and pick up the rented chickens, coop and supplies. As soon as the start of the Rental Period comes back around, we schedule a time to bring your chickens back to you and provide you with another season of rental. I just found out about you can I still rent? Yes! Click here for the location closest to you. I have fallen in love with the chickens, can I adopt them? Yes! Click here for more information! Know someone who has everything and you're in need of a gift? The Rent The Chicken Gift Options are a perfect solution! What is Hatch The Chicken? We are now offering a five week hatch rental service for families, senior care facilities, and schools to see the progression of egg to chick without the commitment. Click here for more information! Looking to nominate a friend, family member, or organization to receive a Rent The Chicken or Hatch The Chicken package through Give The Chicken? Visit www.GiveTheChicken.com for more information!